Got plans for the weekend? If you’re not coming to Indianapolis for True Woman ’18, do the next best thing . . . get the Truth that sets women free delivered right to your home by watching the Livestream. Add a mug of warm cider, a cozy throw blanket, a babysitter or kind hubby to watch the kids, your Bible and favorite journal . . . and you’ve got all the ingredients for a recharging retreat! You might even invite a BFF to share the experience with you. The 10th anniversary conference begins Thursday, September 27 at 6:15 p.m with a backstage preview hosted by Erin Davis, Paula Marsteller, and Samantha Nieves. The opening session leads off with speakers Nancy DeMoss Wolgemuth, Jackie Hill Perry, and Mary Kassian. The event continues through Saturday at 12:15 p.m. ET. Get all the details here! 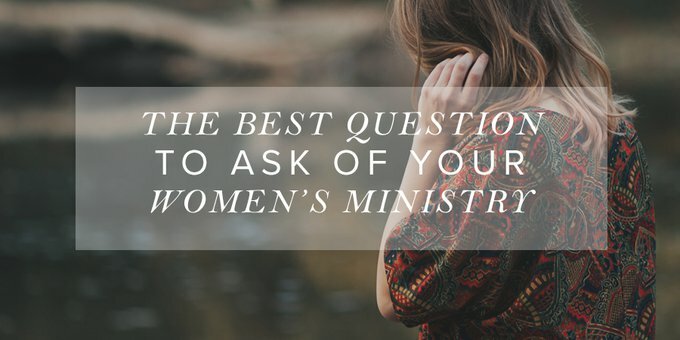 In women’s ministry, we ask lots of questions. When we get together with our teams or committees to discuss and plan the next semester or the next year, we ask one another questions to make necessary decisions about ministry. And they are all important and needed. We ask, “Who?”: Who should lead the study this semester? Who should come speak at our retreat? Who would like to volunteer to run this event? We ask, “How?”: How do we get more of our women to attend Bible study? How do we encourage single women in our church? How do we run our ministry on such a small budget? We ask, “Where?”: Where will we have next year’s retreat? Where will the children go during Bible study? Where will we get the prizes for the giveaway at the annual banquet? We ask, “What?”: What Bible study should we do this semester? What will draw more women to participate? What should we offer for young moms? Indeed, we ask lots of questions in our ministries. But do we ever ask,“Why?” Why do we do the things we do in women’s ministry? Out of all the questions we ask, “why” is probably the most important. It gets to the heart of the matter—the foundation or framework on which everything else is built. Any other question stands upon this one. If we don’t ask this, every other question is meaningless. “Why” gives meaning to our ministry. It points to our mission and purpose. It gives shape to everything we do. Every activity, event, or meeting ought to be an overflow of the answer to this question. If we don’t know why we do something, then the activities we do hold little value. Do you know the answer to these “why” questions? Why does your church have a women’s ministry? Why do you have the events you have? Why do you study the books of the Bible you study or use the study materials you use? Why do you have the ministry groups/opportunities you have? Why do you meet when you meet? Why is your ministry structured the way that it is? Why do women attend your events, studies, and other activities? Any ministry in the church, including women’s ministry, ought to fit into the overall mission of the church. It’s important for women’s ministry leaders to know their church’s mission and the ways in which the women’s ministry helps meet that mission. Because women’s ministry is ultimately about discipleship, it’s important to know how women’s ministry fits into the discipleship mission of the church. The women’s ministry team needs to know the vision and goals the church leadership has for its members—particularly for their growth in faith—and seek to fulfill that mission through the discipleship offerings in women’s ministry. They also need to know the end goal of that learning. Is it to disciple others, evangelize in the community, or some other reason? This means the women’s ministry team can’t work as an isolated ministry; they must work with the church leadership. The women’s ministry needs to have its own mission statement as well, one which reveals how it fits into the church’s overall mission. This statement summarizes the “why” of ministry. It provides the framework out of which the ministry will determine what events to plan, what Bible studies to lead, and what to offer the women of the church. Every idea, event, and activity filters through this mission. For example, if the purpose of a particular women’s ministry is to disciple women to live out the gospel in their God-given design as women, wherever God has placed them, then the events, activities, ministry opportunities, and studies would all help fulfill that stated purpose. Underlying all ministry mission statements is the ultimate call we all have to glorify God (1 Cor. 10:31). This is the one “why” that must be included in every plan, mission, and purpose. We don’t plan events simply to draw large crowds. We don’t use a particular Bible study book simply because it’s the most popular one out there. We don’t do certain activities because we’ve always done them. And we don’t do certain things because it’s what everyone expects. Rather everything we do is for the glory, honor, and praise of the Lord. At the end of the day, this is the measuring stick we ought to use against every plan we make for our ministries. At your next women’s ministry planning meeting, be sure to ask lots of questions. But make certain “why” is one of them.